Patch Clean Up Help Wanted! And we need YOU to help clean up! Patch Clean up is THIS Saturday! We have sold over $20,000 worth of pumpkins this year!! That is the most in at least the last 10 years. Thank you to all who have participated, purchased, and volunteered! 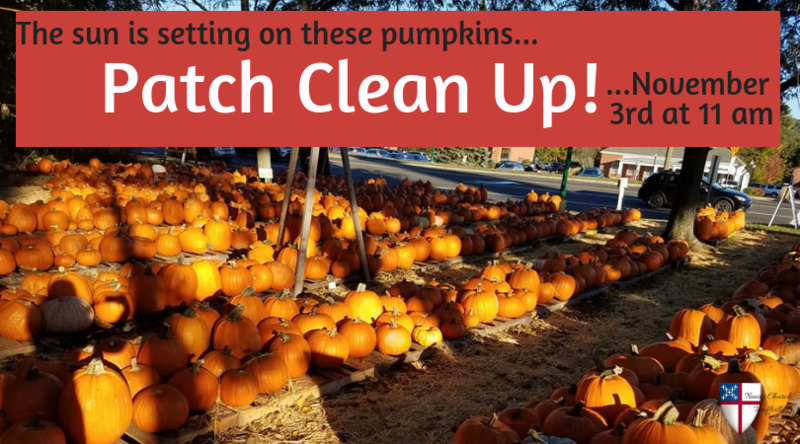 This Saturday at 11 am we will be meeting at the Patch to celebrate, close, and clean up for 2018. As always, we are looking for as many hands as possible to help this go quickly and efficiently. Consider bringing, rakes, blowers, tarps, and the like, in order to make the area look nice for the Boy Scouts who will be moving in soon after us. We are also looking for Trucks or Trailers to help move all the equipment back to Trinity and Specialty Saw for Storage. 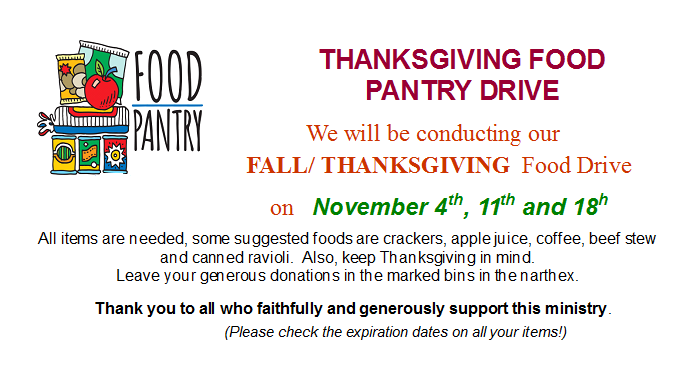 Please, let me know if you are coming so I can make sure we have enough food for all our helpers! Pumpkin Patch- THE PUMPKINS ARE RUNNING LOW!!! We have brought in over $18,000 already for our patch! Thank you! To all the volunteers who have signed up to cover shifts and all those families who told their friends and neighbors about our patch; we would not have been able to do so without you. There are still some shifts needing to be covered! Sign up on SignUpGenius at: https://www.signupgenius.com/go/4090d4eadaa2aabff2-pumpkin1 or on the bulletin board next to Drive Thru Coffee. Remember, this is the largest fundraiser of the year and we want to make sure that all of our students are able to go on Mission trips if they choose. Thank you for all your help with this patch and all of our Fundraising. Youth Group- No Youth Groups this week due to the Emmaus Weekend. Wreath Sales: Our Wreath Fundraiser is back in the Welcome Foyer near Drive Thru Coffee. See the table to order your wreath. We have a list of what you ordered last year, if you did so, as well as the prices and sizes for this year. Students who are going on the Mission trip this year are also selling these wreaths and a portion of sales they bring in goes directly toward bringing down the cost of their trip. Mission Trip- The Mission Trip for Next Summer is going to be New York City with Center for Student Mission (CSM). We have gone on a trip with CSM in Boston back in 2016. Unfortunately, the CSM center in Boston has closed so we are going to go to NYC this year. The Trip Dates are August 6-10, 2019. Like last time, we are going to be looking for at least three other adults to come on the trip. It would be extra helpful if those adults are willing to drive. We can have as many as 12 people on this trip, so talk with your kids and see if this is something they are interested in. Our Mission Trip potluck this year will be November 11th from 7-8:30. 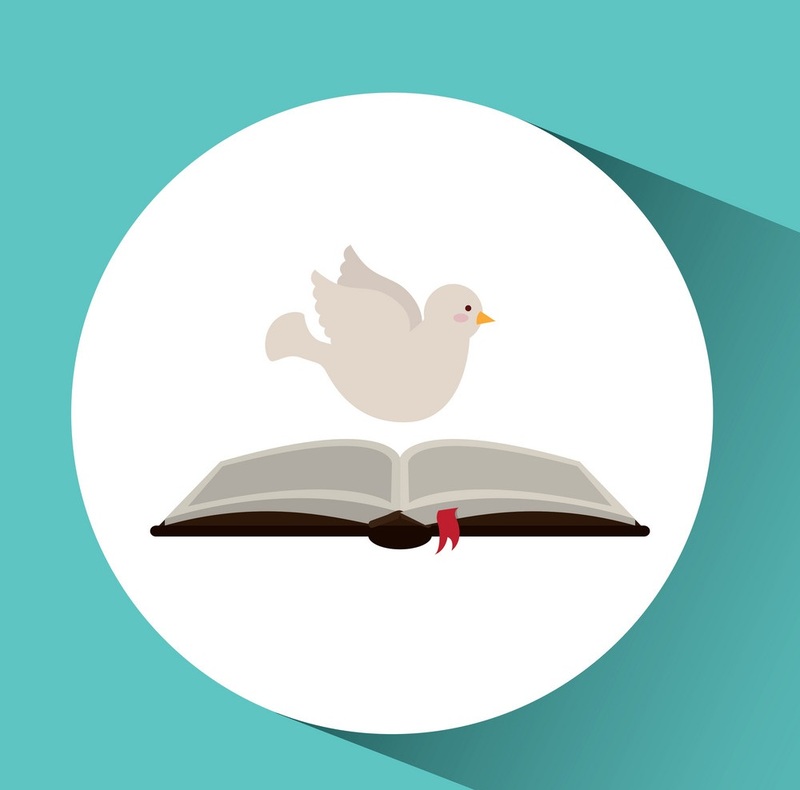 Christmas Pageant: The Christmas Pageant this year is based on the song by Casting Crowns, Christmas Offering. We will be discussing all the things we can offer to Jesus at Christmas, as only Kids can. This is going to be another wonderful Pageant that your children and friends offer to each of us, please sign your children up in the Welcome Foyer by Drive Thru Coffee and tell all your friends and family to come see it! 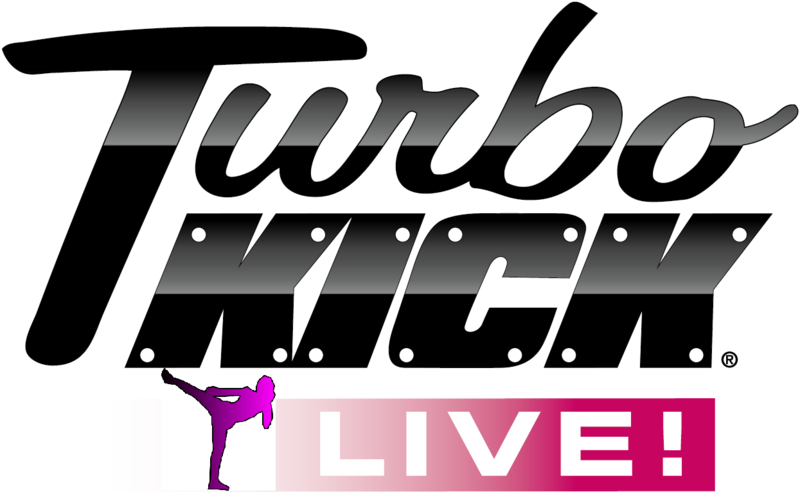 New time for Turbo Kick Live this week! 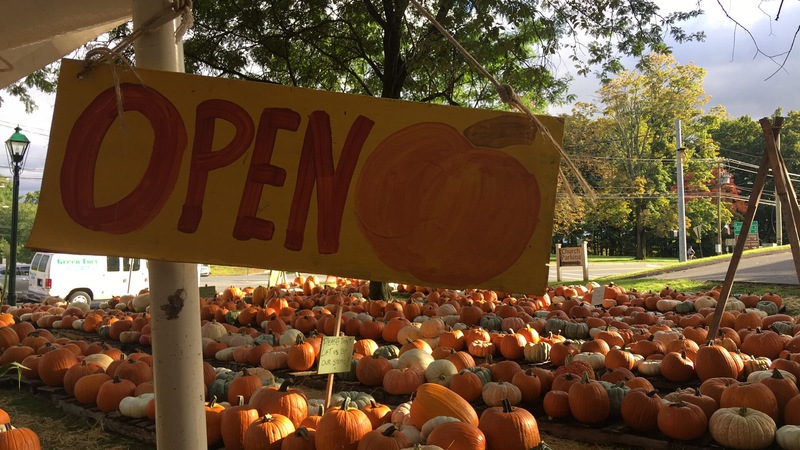 There are still a bunch of shifts available for the Pumpkin Patch. Will one of them work for you? Tuesday I work at the Y at 4 pm so I cannot cover that shift. If at all possible please try to cover that shift first. Thank you!! Remember this fundraiser is about supporting the youth programs at both Trinity and First Church, getting to know the people in our community, and sharing our faith with the people around us! It is not just about Pumpkins! It is also about you! I hope to see your names on the Patch Shift Calendar soon! 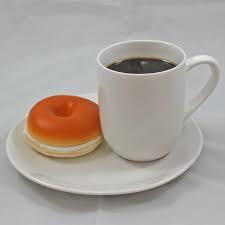 Free Coffee & Bagels: This Sunday after the 9:45 service, coffee and bagels are available in the Parish Hall. Stop in for some warm coffee, fresh bagels and great fellowship. Tuesday Morning Women’s Bible Study: This session is a study of the book of Ephesians. The group meets October 30th at 10am in the library. The companion book is available for purchase at the bible study. The cost is $5.00. Any questions call Sue Galici at 860-614-9313. Ready to become a total knockout? With fun, rhythmic cardio kickboxing moves and high-energy music, you’ll get ultra lean and toned—while having a blast! Sessions held every Wednesday at 10 am in the Parish Hall. Free childcare is provided. Contact Tessa Eichelberger for more information. 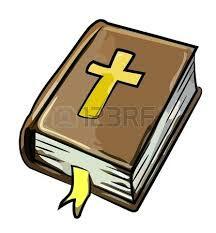 Wednesday Bible Study, October 31st at 1 pm in the Library. Come and learn to listen to the Lord speak through the scripture. Each Wednesday we will choose one of the readings from the Sunday Lectionary. Using the Dwelling in the Lord method of bible study, we listen, share and pray. Our study is now open for men and women! Come and see. Men's Breakfast, Saturday, November 10th, at 8 am: in the Parish Hall. All men are invited to join in for a light breakfast and good conversation. Pumpkin Patch update! 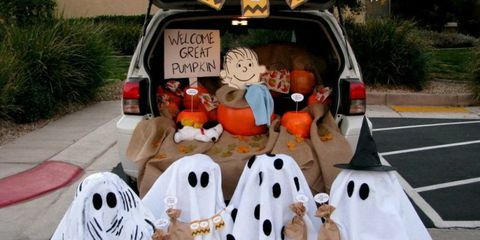 Looking for a few more cars for Trunk or Treat! Teacher meeting this Sunday! 11:30 in Manda’s office. Pumpkin Patch- THE PUMPKINS ARE HERE!!! We have brought in over $8,000 already for our patch! Thank you! To all the volunteers who have signed up to cover shifts and all those families who told their friends and neighbors about our patch; we would not have been able to do so without you. There are still some shifts needing to be covered! Sign up on SignUpGenius at: https://www.signupgenius.com/go/4090d4eadaa2aabff2-pumpkin1 or on the bulletin board next to Drive Through Coffee. 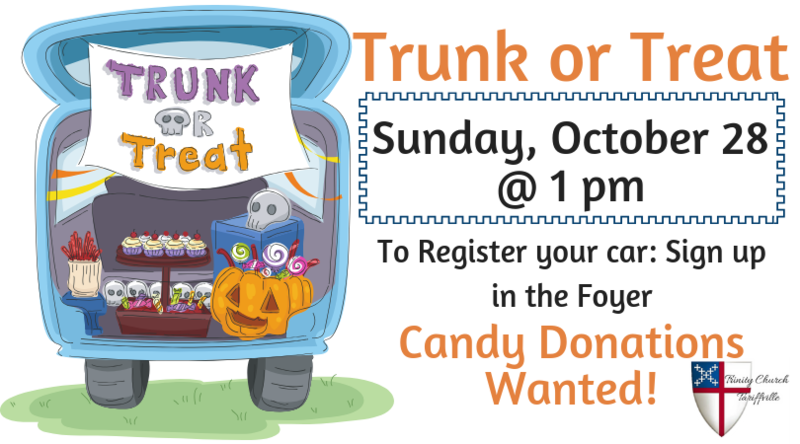 Trunk or Treat- We are looking for a few more families to decorate their cars for trunk or treat! We currently have 7 cars committed to being decorated and we were hoping for 12. If you want to decorate your car/ turn it into a monster, football game, witches’ hovel, gingerbread house Hansel and Gretel style then either shoot me an email or sign up on the bulletin board near drive through coffee. Then start decorating! PS. The football car gets to park next to me… especially if you are watching the game. Cars should be set up on the Tariffville Green by 1 pm on October 28th! Regular Sunday School, No Youth Groups on the third Sunday of the month. Can you interact with members of the community? There are a number of shifts available for the Pumpkin Patch. Will one of them work for you? Tuesdays and Wednesdays I work at the Y at 4 pm so I cannot cover those shifts. If at all possible I would like to see those two shifts covered first. 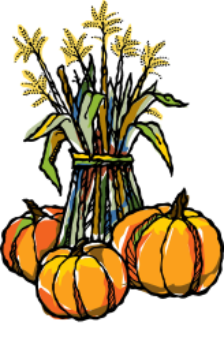 Pumpkin Patch Update, the first DIGG church of the year, and the Mission Trip Potluck in November! Pumpkin Patch- THE PUMPKINS ARE HERE!!! We have brought in over $4,000 already for our patch! Thank you! To all the volunteers who have signed up to cover shifts and all those families who told their friends and neighbors about our patch; we would not have been able to do so without you. There are still some shifts needing to be covered! Sign up on SignUpGenius at: https://www.signupgenius.com/go/4090d4eadaa2aabff2-pumpkin1 or in the Foyer at Church. 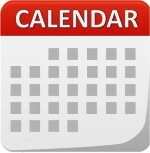 Sunday School- this Sunday is the First DIGG of the year. We are going to be going over the different parts of the service and explaining what we do and why.